Sugarfree is a sleeper little famous band that is quite known for huge, almost anthemic hits. 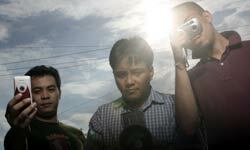 They first burst into the mainstream with the highly successful single, “Telepono,” which is included in the critically and commercially successful debut album, “Sa Wakas.” Composed of Mitch Singson on drums, Jal Taguibao on bass, and Ebe Dancel on vocals, Sugarfree is a three-piece band heavily influenced by the likes of Popsicle, Oasis, and Radiohead. As songwriters, Ebe likes the style of Sheryl Crow and the Counting Crows. In January 2003, the little known Sugarfree back then quietly released their debut album “Sa Wakas.” The band endured a terrible two-years worth of wait and an even more terrible tussle with their previous label just to be able to release the album. In the launch, “Sa Wakas” reportedly sold out in a span of 11 minutes. The collective sighs of relief from the band and their supporters created a huge holler in the mainstream music scene, opening the doors once again to the so-called underground band scene. Soon, a string of Sugarfree songs lorded the airwaves: “Telepono,” and then came the very sad “Mariposa,” then “Hintay” and then finally “Burn Out.” Well written tragic lyrics, easy and happy melodies capture the hearts and ears of the many believers and supporters of the band. Something about their laid-back stance, their easy-going attitude and the tragic, mundane love stories make them very easy to relate to and appealing—even if they aren’t the best looking rockstars the scene has to offer. In the NU 107 2003 Rock Awards, Sugarfree went home huge winners. They brought home two huge awards that night: the Best New Artist and the Album of the Year accolades for Sa Wakas. And just recently, they bagged the Best Rock and Best Alternative Song awards in the 2004 Awit Awards, also from their debut album. Sugarfree’s band history is quite simple. In college, Ebe went through a succession of bands. Everything was going mediocre with nothing really breaking out. Ebe was ready to call it quits, when he met Jal and Mitch. “Sabi ko sa sarili ko, huling subok ko na. Kung mag-fail ‘to, siguro hindi talaga para sa’kin,” Ebe shares, “then everything just fell into place.” The three easily penned songs, played in the underground, earned admirers and supporters, became a main stay in production nights such as Admit One in Freedom Bar. They signed with Viva, but was put on a terrible wait list. Sugarfree, however, managed to record “Sa Wakas” with their “honorary member” Rivermaya frontman Rico Blanco. But when Rico had to leave to start work with Rivermaya, Dancel and studio genius Angee Razul carried on the mantle of production. After more than a year, Sugarfree was able to complete the 12 songs that were soon to become “Sa Wakas.” Then more waiting happened, the tussle between labels came to be, and then finally, the sweet success. Sugarfree sold records, performed countless gigs across the archipelago, and won awards. More than a year has passed since “Sa Wakas” and Sugarfree is back at it again: back with their witty and smart lyrics, with their easy melodies, and now, with happy songs. 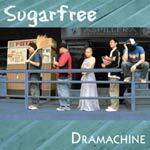 Yes, after the sad “Sa Wakas,” Sugarfree comes up with “Dramachine,” album that contains happy, and happy-go-lucky songs.